The Russia investigation in the U.S. has given the Georgian ex-president a chance to reclaim a bit of his stature on the world stage. Georgia's former president, Mikheil Saakashvili, appears on Fox TV. 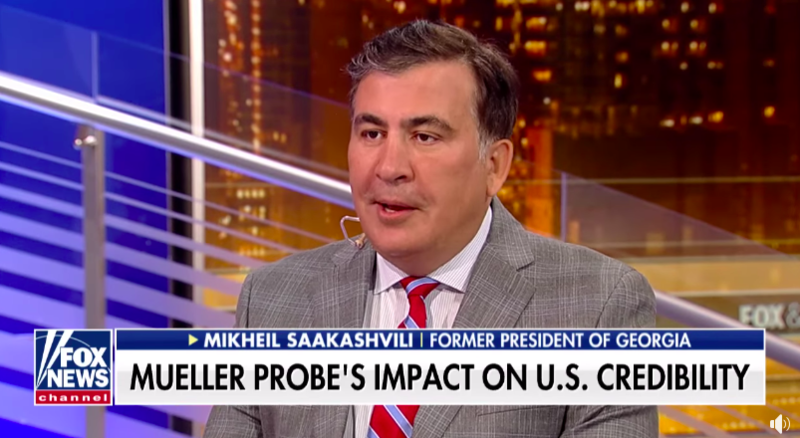 Since the Mueller report came out, Saakashvili has been doing the rounds defending U.S. President Donald Trump from charges he colluded with the Kremlin. With the U.S. still processing the anticlimactic finale to its Russia investigation drama, Georgia’s former president Mikheil Saakashvili has inserted himself into the story to speak up for President Donald Trump and chastise the Obama administration on its dealings with Moscow. Now living in exile, Saakashvili styles himself as a post-Soviet Robin Hood, railing against his archnemesis Russian President Vladimir Putin and the oligarchs that now run his former home countries, Georgia and Ukraine. The Russia probe in the U.S. has given Saakashvili an opportunity to claim a bit of the spotlight and conservative U.S. media – while often struggling to pronounce his last name – are eating it up. In late March, special counsel Robert Mueller finished his long-awaited report into Russian interference in the U.S.’s 2016 presidential elections, a summary of which exonerates Trump of the most serious allegation – that he colluded with the Russian effort. Saakashvili is a blast from the past for Trump. Back in 2012, Trump visited Georgia, when he was still a real estate developer and Saakashvili still president, to give his blessing to the construction of the Trump Towers project in Batumi. That year, however, proved fateful for Saakashvili: he suffered an electoral loss to Bidzina Ivanishvili (as it happens, another real estate developer who decided to enter politics). Saakashvili ended up banished from one country after another – first Georgia and then Ukraine – and the Trump Towers have never come to pass in Georgia. In his comments to Fox, Saakashvili maintained that, as with the 2016 presidential election in the U.S., Russia meddled in the 2012 parliamentary election in Georgia that effectively ended his rule. Misha’s version of what happened in Georgia in 2012 is in fact very similar to what Trump critics believe happened in the U.S. in 2016: Putin installed a friendly billionaire in charge of a foreign country. Except, in Saakashvili’s telling, in Georgia’s case Ivanishvili was indeed in cahoots with the Kremlin. “They [the Russians] did exactly same thing that the Mueller probe established in the United States: they did mass disinformation campaign, they did social media campaign and they did also mass hacking of our computers, telephone systems, so all kind of stuff that we now are painfully aware of in America,” Saakashvili said. Saakashvili went on to say that his complaints about the alleged Russian meddling fell on deaf ears in Washington and now he knows why: Moscow-paid advisers to the Obama administration dissuaded Washington from weighing in. Here is how it went down, according to Saakashvili: Hilary Clinton’s long-time confidant Sidney Blumenthal sent a letter to then Secretary of State Clinton advising her against backing Saakashvili in the 2012 election; enclosed in the letter was a message from the billionaire Ivanishvili himself and his American consultant, John Kornblum, a former U.S. ambassador to Germany. “Please stop supporting Saakashvili because he would turn Georgia into a Caucasian Cuba and make our meaningful relations with Russian impossible,” Saakashvili said, quoting loosely from Kornblum’s publicly available letter to Clinton. The letter does confirm that Kornblum was on Ivanishvili’s payroll. There is no evidence that Ivanishvili – currently the effective leader of Georgia – himself was a Russian project, though it remains a popular theory among some in Georgia. Still, many Georgians would challenge Saakashvili’s story as they believe that it was his own excesses that sealed his fate, not some foreign intervention. Saakashvili was not on TV to diss Clinton, though, but rather to reclaim his relevance on the international stage and to impress friends and enemies back home. He said he’d be happy to oblige the U.S. media with his two cents on Trump and the American national security issues anytime. “I would be honored to do a special report or speak at more length on these issues anytime,” Saakashvili wrote later on Facebook. Giorgi Lomsadze is a journalist based in Tbilisi, and author of Tamada Tales. Sign up for Eurasianet's free weekly newsletter.